Peak Performer Rolled Ridge Vents - Air Vent, Inc. This low-profile, shingle-over vent installs at the peak of the roof allowing exhaust ventilation along the entire ridge -- end-to-end. Made of durable polypropylene construction, this rolled ridge vent conveniently conforms to any roof pitch. For years, Air Vent's independent research and testing have demonstrated that the best performing ridge vent, in terms of airflow and weather protection, is an externally baffled ridge vent. We've taken that technology and rolled it (literally) into our newest ridge vents in 28-foot rolls: Peak Performer™ I (unfiltered) and II (filtered). They install fast and are virtually invisible on the roof. Free nails -- Two coils of roofing nails are included. Fast and Easy Installation -- Internal ribbing adds rigidity to make the vent nail gun friendly. Roll it out and nail it down. Enhanced Airflow -- The external baffle creates low pressure above the vent openings as the wind blows to increase airflow performance and deflect weather away from the attic. Built-in End Plugs -- There's no need for separate end plugs. Peak Performer I and II have integrated end plugs. Double Weather Protection -- Peak Performer II's internal weather filter acts as a secondary level of defense against weather infiltration. Low-profile, shingle-over vents your attic/building. Once installed, its almost invisible. When installed properly, all Air Vent products mentioned here comply with the net free area requirements of nationally recognized model codes, including those written by the International Code Council. In addition, the vents have product evaluation approvals from Dade County, Florida, ICC and TDI. Please call 1-800-AIR-VENT to obtain code body information for a particular Air Vent product. Here's an overview of the specifications for Air Vent's complete line of ridge ventilation products. View the wide range of colors in which our products are available in our pdf color chart (12 KB). Charcoal 4' 18 sq. in. per ft.
ridge vent Charcoal 4' 16 sq. in. per ft. Bronze 10' 18 sq. in. per ft. Bronze 8' 18 sq. in. per ft.
ridge vent for diagonal hips Black 4' 12 sq. in. 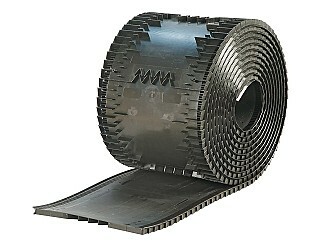 per ft.
ridge vent Black 4' 18 sq. in. per ft.
with a bag of 30 3-inch ring shank nails taped to each 4-foot piece. Black 4' 18 sq. in. per ft.
Venting packs contain four pieces plus two end plugs, three connector plugs and straps. Flash FilterVent includes four pieces of Supplemental Flashing. Note: Venting packs can be shipped UPS, except Zinc. According to most building codes, you need 1 square foot of ventilation for every 150 square feet of attic floor space. For new home construction that includes a vapor retarder, the minimum is 1 square foot of ventilation for every 300 square feet of attic floor space. If your vents are split between ridge vents and intake vents, the minimum requirement is also 1 square foot of ventilation for every 300 square feet of attic floor space. 1. Determine how much net free area is needed to satisfy FHA requirements. 2. Balance your ridge vent system. 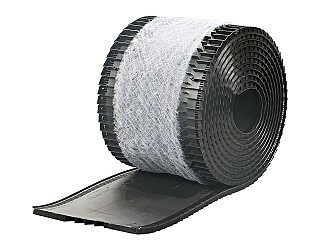 Note: ShingleVent II and Multi-Pitch FilterVent provide 18" of net free area per linear foot. Measure the square footage of the attic (length x width). Measure the length of the ridge. Refer to the chart above for required net free area and minimum length of ridge for attic square footage. Note: In most cases, the length of the ridge balanced with the same net free area of intake vents will satisfy FHA minimum standards and most building codes. Use the chart below to calculate the amount of intake vents that should be installed to balance your ridge vent system. Always install ridge vents from end to end across the entire ridge for best appearance and to provide maximum ventilation area. Hip roofs, dormers and T- or L-shaped roofs may require a specially designed ventilation system. For information, request a copy of Air Vent's Principles of Attic Ventilation.See Contact Us. 16" x 8" 16" x 6" 16" x 4"
Air movement is the key to efficient ventilation to help eliminate damaging conditions in your attic. Ridge vents provide constant airflow along the entire undersideof the roof to help remove heat and moisture.